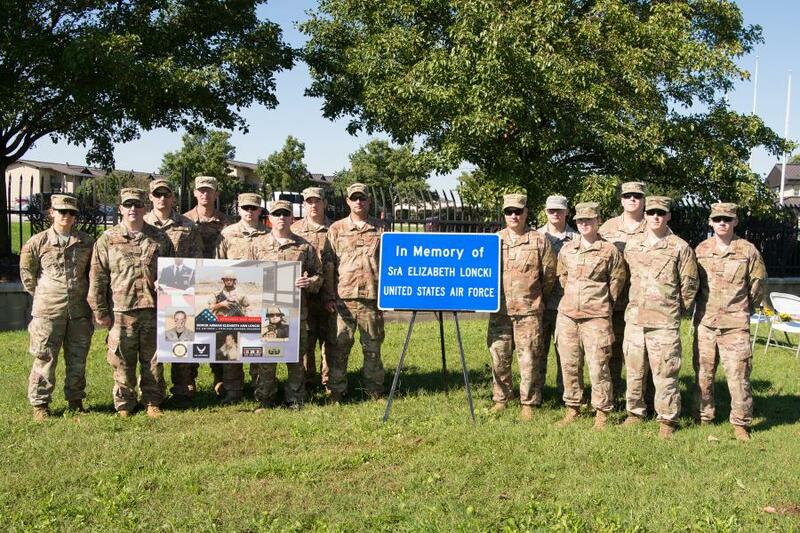 Fellow service members, family, friends and officials gathered at Dover Air Force Base to dedicate the bridge over Route 1, between DAFB and base housing, to Elizabeth Loncki, the first Delaware woman killed in Operation Iraqi Freedom. On Oct. 12, Gov. John Carney, Delaware Department of Transportation Secretary Jennifer Cohan, Delaware's congressional delegation and military and veterans' leaders gathered at Dover Air Force Base to dedicate the bridge over Route 1, between DAFB and base housing, to Elizabeth Loncki, the first Delaware woman killed in Operation Iraqi Freedom. Oct. 14, would have been Senior Airman Loncki's 35th birthday. Loncki was 23 when she died on Jan. 7, 2007, after her explosive ordnance disposal team was targeted by a car bomber near Baghdad, Iraq. Loncki, a New Castle native, attended St. Peter the Apostle grade school and graduated from Padua Academy in Wilmington in 2001. She briefly attended the University of Arizona before enlisting in the Air Force. "Elizabeth Loncki was a brave young woman who sacrificed her life in service to her country, and DelDOT is grateful to have the opportunity to name this bridge in her honor," said Cohan. "Elizabeth's dedication to the greater good is something that we should all strive to emulate, and we hope that this bridge will serve as a lasting testimony to her values." "Today we are honoring Elizabeth Loncki — a Delaware hero who made the ultimate sacrifice while serving her country," said Carney. "I am humbled by the sacrifices made by our men and women in uniform who selflessly go into harm's way to protect us here and abroad. We are proud of all those who have served, and for the many sacrifices made by our active duty and reserve members, our veterans, and their families, in order to preserve our freedoms." "We are honored to share in dedicating the bridge, which most of us use on a daily basis, to the honor and memory of Senior Airman Elizabeth Loncki," said Colonel Joel Safranek, commander of the 436th Airlift Wing, Dover Air Force Base. "She made the ultimate sacrifice for her country, and it is only fitting to have this memorial here at Dover where we return our fallen service members with dignity, honor and respect. I am grateful to be part of this and pleased to see the project come to completion." "I would like to thank the Congressional Delegation, Governor Carney, Secretary Cohan, Mayor Christiansen and all of the Representatives for being here on this worthwhile occasion," said Staff Sergeant Johny Hargove, who proposed the idea for naming the bridge for Elizabeth Loncki. "It is certain that we all have one thing in common today and that is our admiration for Senior Airman Liz Loncki. I can't think of a better way to be reminded of her sacrifice than to see her name memorialized on this bridge. Thank you to all who made this possible. It gives me great privilege to be on the team that brought this to fruition."